Before resigning five weeks ago, Baltimore auditor Audrey Askew expressed concern to colleagues that she was getting incorrect and unsupported numbers from the Finance Department, The Brew has learned. The numbers – which Finance said accounted for federal grants to city agencies as well as cash and investments on hand – led Askew to press for a “qualified” or “modified” opinion to the Comprehensive Annual Financial Report (CAFR). Such an opinion could affect Baltimore’s credit rating and also result in queries by federal agencies over the city’s use of grant money. As a result, Askew was encouraged to “go easy” on city finances. Askew’s abrupt departure was never explained by her boss, Comptoller Joan Pratt, or other City Hall officials except for comments to the effect that Askew was “rigid” and looked at financial accounting in “black-and-white” terms. Askew herself offered only cryptic remarks – “I am a person of integrity” – when she was reached by The Brew, which broke the story of her resignation. Sources say Askew’s “qualified” audit proposal was questioned by Finance Department officials and by SB & Co., the Hunt Valley firm hired by the Pugh administration to share responsibility to review the CAFR report. SB founding partner Graylin Smith and Finance Director Henry Raymond pressed Askew to “write-off” some of the federal grant money to balance the books, The Brew was told. 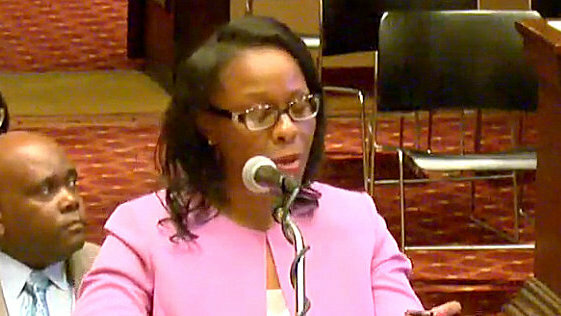 After Askew asked Pratt to back her in the dispute, she faced “interference” by Deputy Comptroller Harriette Taylor, who began attending CAFR meetings. The friction between Askew and Taylor intensified prior to Askew’s resignation, which took place after she burst out of a February 22 meeting with Finance and other officials, sources said. She offered this scenario: “The city auditor voluntarily resigned on February 27, 2019 and thanked me for the opportunity to work with the City of Baltimore. Raymond has not responded to Dorsey’s remarks or to questions from The Brew. Last month, Raymond declined to discuss the CAFR audit. “You need to talk to the comptroller. She is responsible for the audit report,” he said. Askew also declined to discuss why she resigned when contacted by The Brew. ”Baltimore will never know why, but they know why,” Askew said, declining to identify who” they” referred to. Askew has not responded to requests for further comment. During her short tenure, the audit office issued a number of critical reports on city agencies. Hired two years ago as deputy auditor after s career in private audit firms, Askew was named city auditor by Pratt last summer following the retirement of Robert McCarty. During Askew’s short tenure, her office issued a number of critical reports on city agencies. Askew also questioned expenditures by staff surrounding Mayor Catherine Pugh for using a city-issued credit card to pay for dubious expenses. These included meals by staff and a Baltimore hotel stay by “The Voice” contestant Davon Fleming, who Pugh later hired as a voice coach at the Department of Recreation and Parks. Still more money – reported to be $24,000 – was spent by Pugh aides to buy and dry-clean coats to present to homeless people. Pratt has said she formed a committee to interview candidates for the auditor and deputy auditor positions. She said she expects to fill both jobs by the end of April.